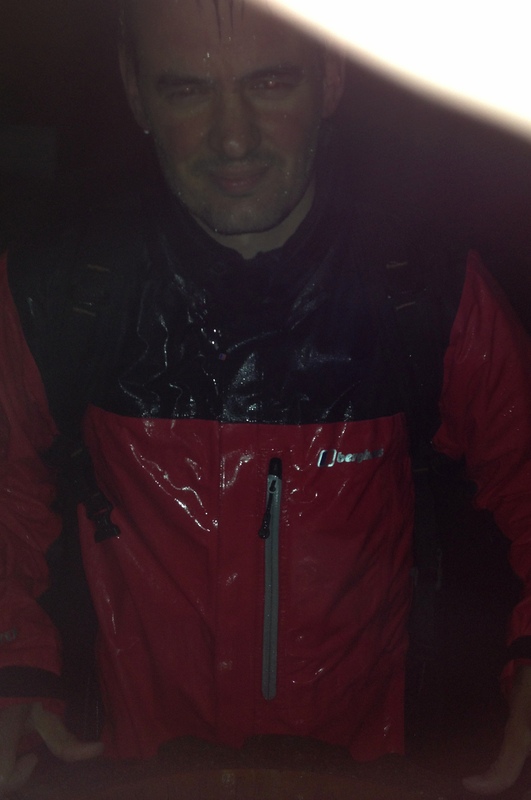 This picture was taken at the top of Snowdon at 1.30am on the summer solstice night after three hours of battering from 80mph winds and the heaviest, most unrelenting deluge I’ve ever experienced. The plan was to bivvy on top of the mountain before an early rise to embark on the Welsh 3000s – an epic challenge to climb each of Snowdonia’s 15 mountains over 3000ft within 24 hours. However, we quickly realised bivvying was out of the question as we were soaked through, and so was all our gear (including the sleeping bags). The combination of rain and wind also meant we’d become extremely cold, to the point that basic function was becoming difficult. The winds became ever more gale force higher up the mountain and we were blown clean off our feet several times. We therefore also realised that the planned morning’s scramble over the knife-edge Crib Goch ridge was no longer a safe option and we’d be unable to attempt the full Welsh 3000s challenge. In fact, we later learned that 9 people had to be rescued off Snowdon that day due to the incredibly strong winds and treacherous conditions and even the elite Welsh 3000s trail race had to be cancelled. However, stubbornly, we refused to let the mountain beat us entirely so battled against the elements to summit Snowdon. Upon reaching the top, without any hope of bivvying or tackling Crib Goch in the morning, we immediately turned round and returned down the mountain as quickly as possible. We reached the car at 4am and then spent a couple of hours shivering in the few dry clothes we could muster. Finally, with the conditions only seeming to get wetter and, more crucially, windier, we reluctantly decided that it just wasn’t safe to attempt the rest of the route which would still have been a 25 mile, 12 peak hike over exposed ridges which would leave us freezing cold, soaking wet and potentially stranded in the middle of nowhere at the end of the challenge. So I failed to complete the fourth of my 10 Challenges 4 Cancer. But to summit Wales’ highest mountain in those conditions, and in darkness, is an achievement in itself. I plan to return and complete the Welsh 3000s at some point but am realistic that it may not be possible in this window of long daylight hours. However if you think that our efforts are still worthy of a small donation to cancer research then please visit my fundraising page here. I’d like to say a big thank you to Imogen for joining me on this crazy challenge and for never letting the very worst of weather dampen your spirits! Watch this space for more updates on my progress in completing 10 Challenges 4 Cancer including kayaking across Scotland, climbing Germany’s highest mountain and walking from Manchester to Birmingham. Click here for more details. PS This is what Crib Goch look like on a sunny day… and why it’s not possible in 80mph winds! 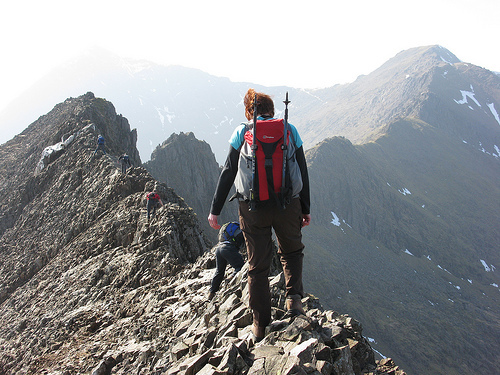 Posted by Jon Maiden on June 25, 2013 in Fundraising, Microadventures and tagged 10 Challenges 4 Cancer, adventure, AICR, Crib Goch, endurance challenges, fundraising, hiking, microadventure, physical challenges, Snowdon, Snowdonia, walking, Welsh 3000s. I’ll be crossing the M56 blindfold. Will you call an ambulance for me in advance?